I was able to hit the water for a while this morning. The beautiful weather had me thinking the White Suckers should be snapping by now. About 30 seconds into my first cast the rod doubled in the bankstick and a heavy fish was hooked. Not a White Sucker, that's for sure. 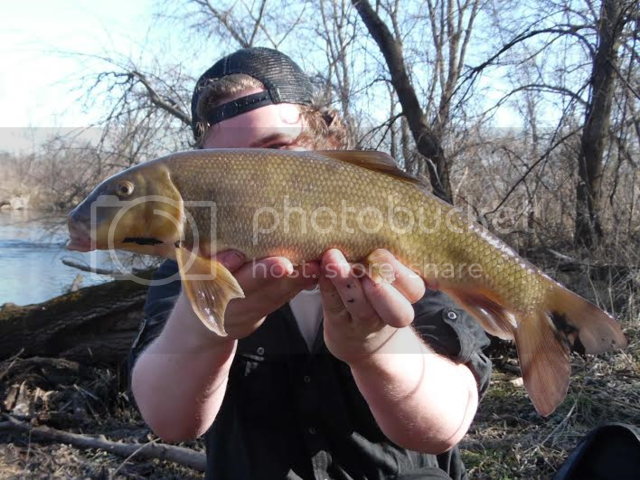 After a strong fight in heavy current it revealed itself to be a Carp! On March 8th.... 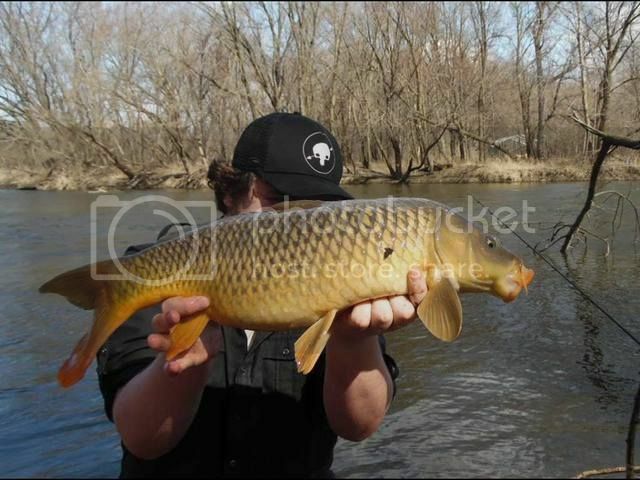 This is by far the earliest I've caught a Carp before. A half hour or so went by with no bites. Then after casting closer to the log jam behind me, the rod tip started to dance again. And again, another heavy fish hooked, this one felt even heavier than the first. Lo and behold, it was another Carp. This one being a fat female full of eggs. Then came a dry spell. No bites for about two hours. Then I caught the only White Sucker of the day, but it was the largest I've caught for quite some time. A nice way to end the day. and yes, I promise that is me behind all those fish. Spring is here early guys so get out and enjoy it! All those fish look to be in very nice condition. Fat and full of sass on the end of the line. With no real runoff to speak of this spring, bet we'll have an early spawn this year like we did in 2012. Right on man, super cool that you got out and found some bites! Chunky fish too, i bet those carp were a blast. Can't believe how warm its been here in the Midwest. Reeled in some honkers! Great job and some wonderful specimens. I have been fighting the urge to chase fish in open water. I was somehow convinced that they just can't possibly be active enough to catch this early in March. I haven't seen a fisherman out anywhere. Any chance you're willing to message me with your location? I'd love to get out and catch some suckers and carp nearby. Hopefully you aren't farther south than I am. Maybe go to the Cannon river, or hit the St. Croix for Sturgeon. Nice fish buddy! FP and I have been chasing burbot all over this winter, so far no luck and we are losing ice fast, sketchy at best in our area, and the lakes with better ice have busted up the accesses so much you can't drive on anymore. Our last adventure was a mile long run out on super slick ice, FP said I reminded him of Bambi trying to stand up on the ice, on foot, portable in tow, no burbots for the lifelist but he did get some really nice fish. His first year ice fishing, we had a blast. I gave it up about 12 years ago, one of those plenty of people to fish out of your house, but nobody to help pull it off again deals, and I despise cold more and more every year lol. I'll have to try and figure out how to post pics here (other then lifelisters) as I'd like to share some good shots with you guys. 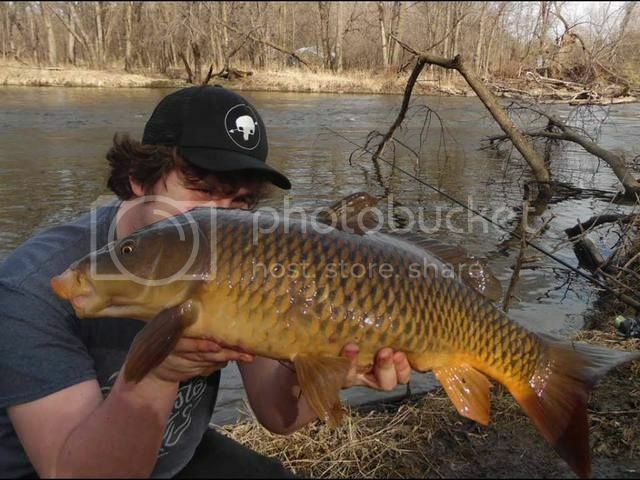 I actually went back through my records and my earliest carp is April 9. Might beat it this year, though, but our rivers are still locked up tight. Reading this thread has served to amplify my cabin fever. Thanks tons........Haha. That really is a chunky sucker- looks like the winter treated it pretty damn well! Gorgeous fish man! And an excellent spring report! Gotta love this early spring weather this year ! Thanks for the kind words guys! Yesterday I bought a car, so to celebrate I went back to the Carp grounds. Same story as last time, two Carp and one Whitie. 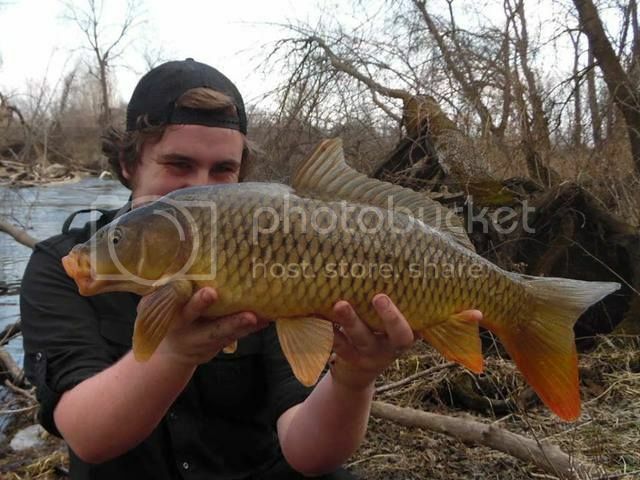 The second Carp I got yesterday was a tank though. Still can't believe we're getting this kind of action this early in the year.